Rules of Six is an installation commissioned as part of the Design and Elastic Mind exhibition at the Museum of Modern Art in New York curated by Paola Antonelli. 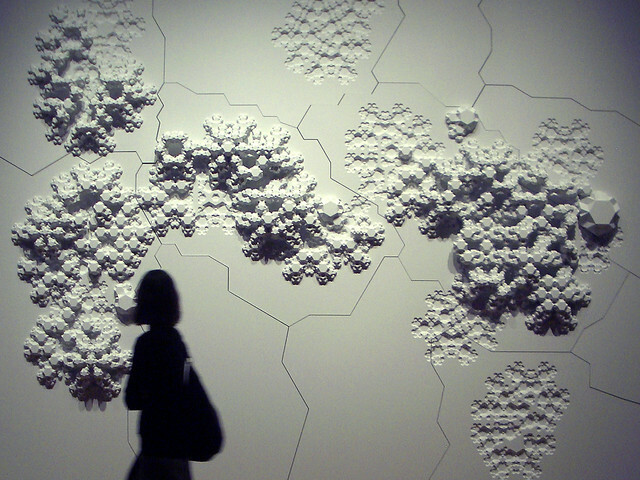 In collaboration with material scientist Matthew Scullin, the project explores the notion of self-assembly, where top-down methods for determining form are replaced by bottom up rules of formation; where new material structures are not carved or composed by conventional tools but are “grown” through simple interactions between components or molecules. At the heart of the project is a custom piece of software written in the Processing programming environment that simulates formation over time in the same way molecules assemble themselves in the lab. Three-dimensional output from this application was used to produce a large-scale wall relief mounted in the gallery alongside two monitors: one running the simulation “live” and the other displaying a slideshow of actual nanostructures designed by Scullin and his colleagues. Like the nanostructures it emulates, Rules of Six is designed to multiply indefinitely without sacrificing stability. It is indifferent to scale; its sprawling construction could represent molecules, rooms, buildings or entire neighborhoods. The title, Rules of Six is an ode to Wilson Bentley, the Vermont farmer who, around the turn of the 20th century, photographed thousands of snowflakes on his homemade camera and empirically proved that no two are alike. Though it was plain to him something was behind the phenomenon he was seeing—the simultaneous unyielding sameness and infinite possibility—the forces that guide the snowflakes growth remained elusive to him. “What magic is there in the rule of six that compels the snowflake to conform so rigidly to its laws?” Bentley wrote in Technical World, 1910. The restless spirit that drove Bentley to search for the hidden still inspires us to this day.